We were told by so many people that if we loved Vienna, then we will love Prague. It just so happened we would be seeing them in the opposite order, but we still expected to find Vienna just as charming. We arrived mid-afternoon on Thursday and made our way to our Airbnb. The local transportation was easy on the trains and a gentleman nearby pointed us in the right direction before we boarded. The accommodation we chose was a room in a large 2 bedroom apartment. The bedroom was small, but the huge living areas made up for it. 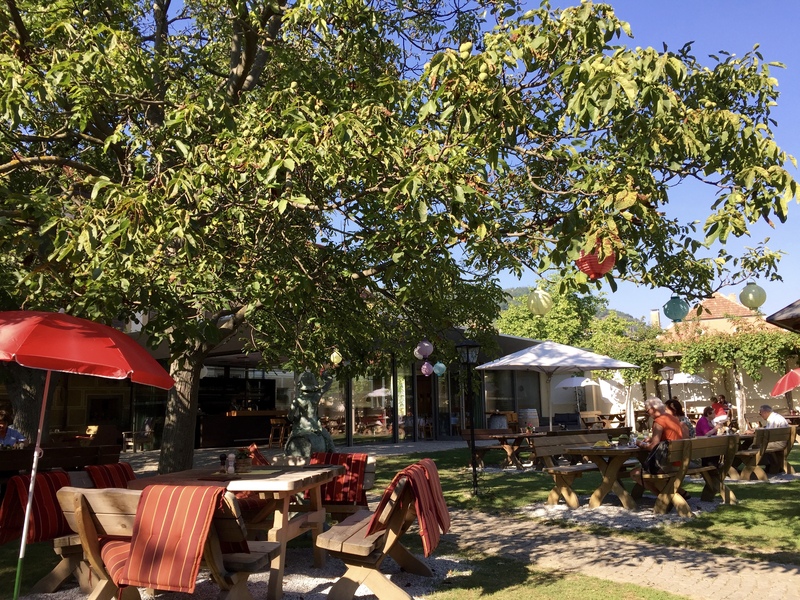 Also, it turned out that the nice couple that owns the place left the city for the weekend, so we had the place all to ourselves…always a plus. So far, we were off to a good start. 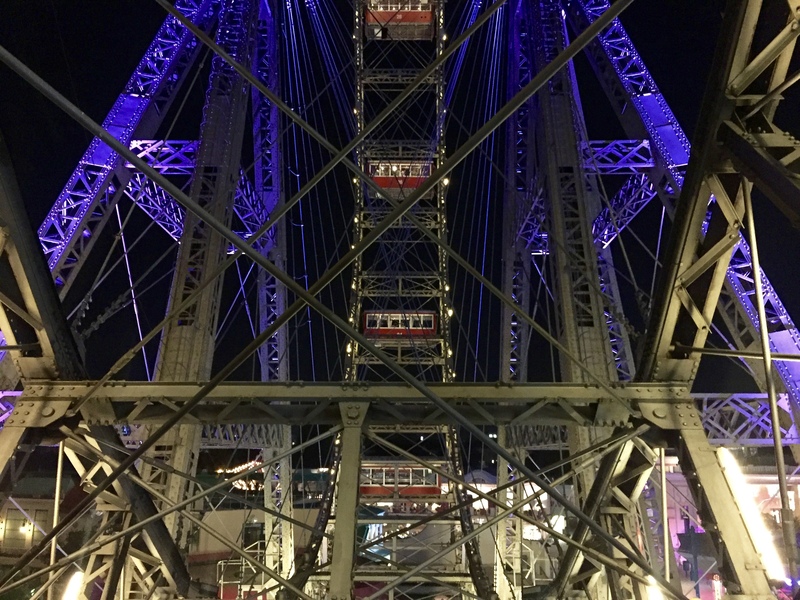 Once settled in, we headed out Prater Park to ride the Wiener Riesenrad, a historic Ferris wheel built in 1897. We have Prue and Paul to thank for this recommendation after listening to them tell the story of their marriage proposal, so romantic!! Along the way, we stopped for dinner at a small café as evening was arriving and the outdoor seating was drawing us in. 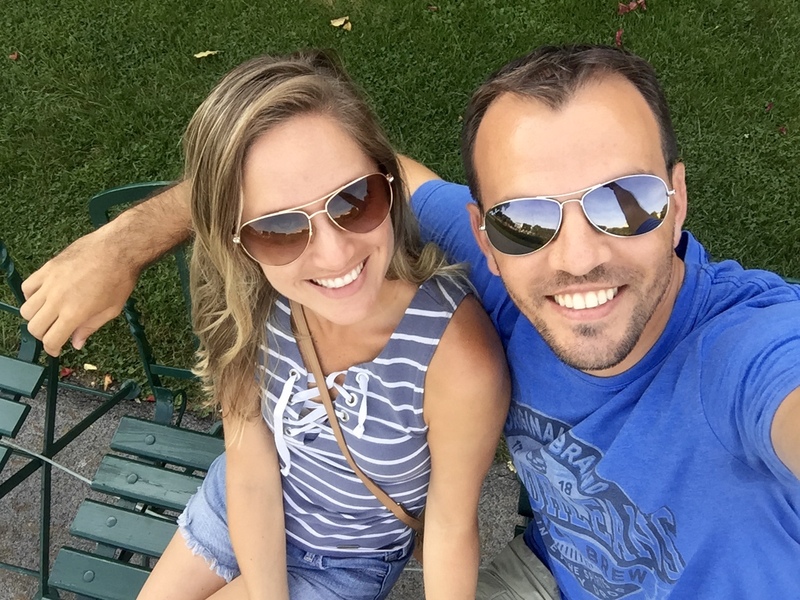 Afterward, we continued over to the park for our own romantic night ride on the Ferris wheel. Once we entered the Prater Amusement Park, we easily found the entrance and waited our turn. 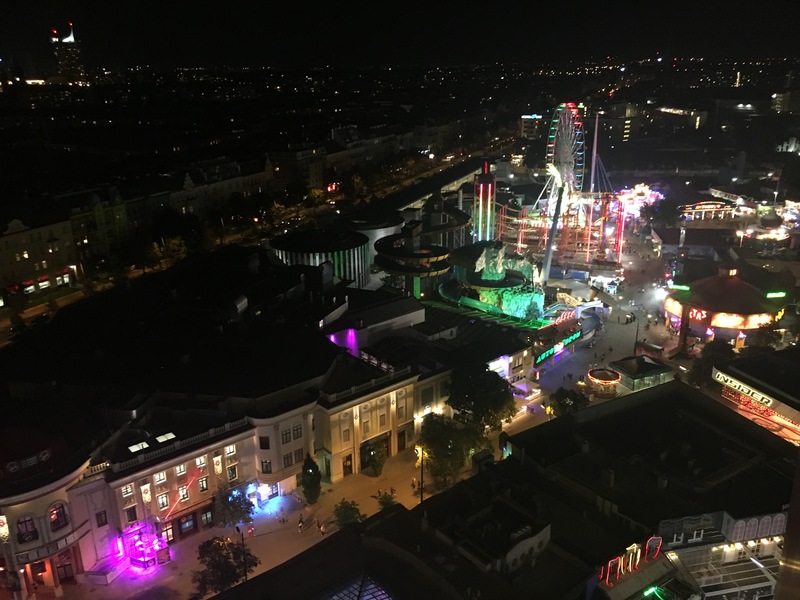 We noticed a few Ferris wheel cars packed with people, while others were set up for a romantic dinner for two. Now I see what Paul had arranged. 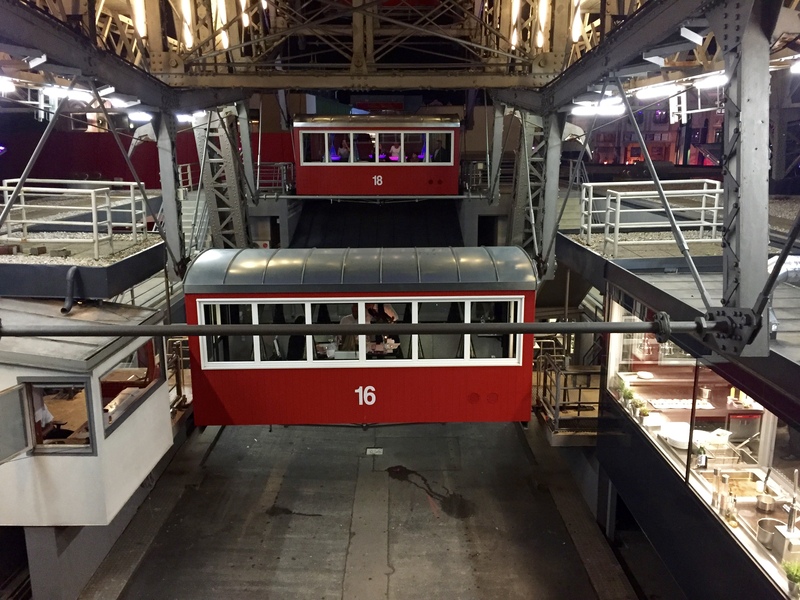 The air was cool, the lights were glowing softly, and the staff were gently offering the dinner courses in an organized sequence complimenting the evening. For our ride, however, we loaded up in the economy car, luckily with only about 7-8 other people. The views as we went around the wheel were lovely, with the city lights spread in all directions. It was the perfect way to begin our time here. 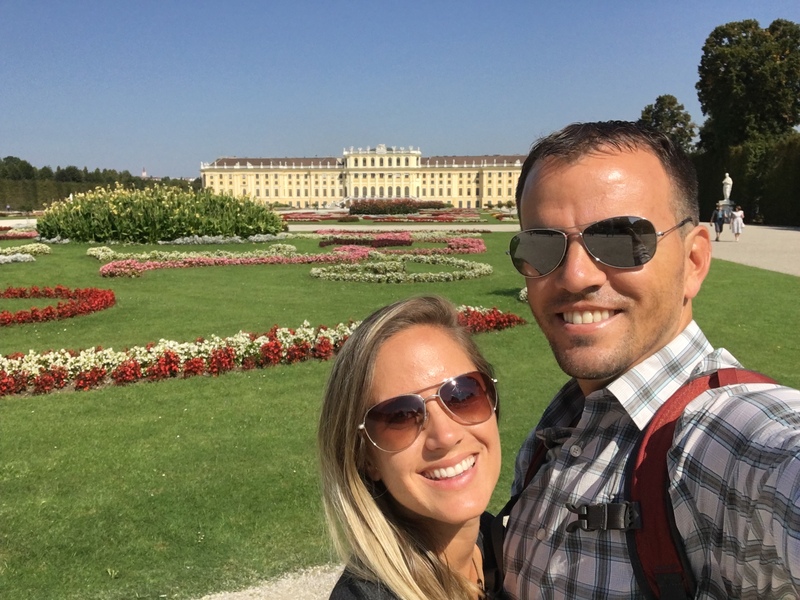 The next morning, for our first full day, we chose to go to Schonbrunn Palace located just outside of city center. I would say it is very similar to Versailles near Paris, but a bit smaller. I’d like to think it was modeled after Versailles by the Habsburgs, but I haven’t looked it up. Our tickets included entrance to the palace and a free audio guide which always makes wandering through these type of places much more enjoyable. 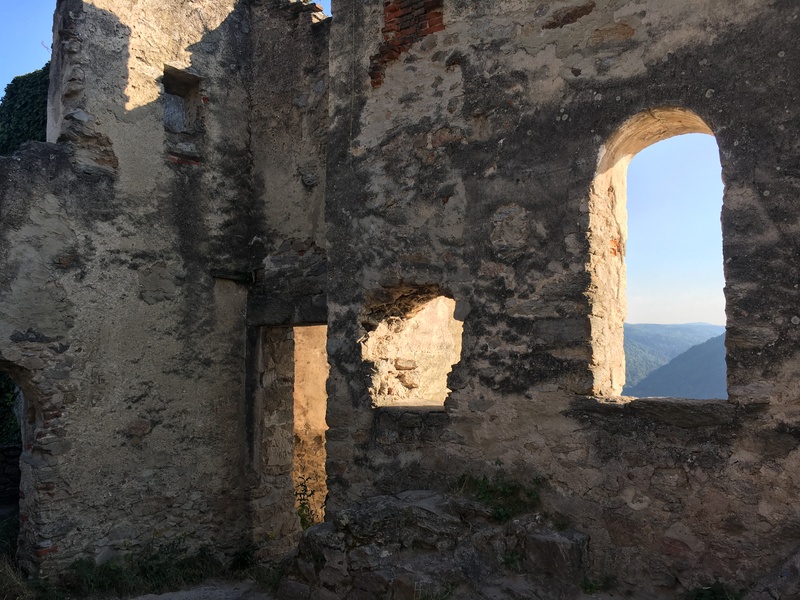 It was interesting to see how Franz Joseph, the longest-reigning emperor of the Hapsburg Monarchy, did his best to live life more simply in his palace. The monarchy fell not long after his death and since then it has become a museum for the public. Afterwards, we decided to wander through the gardens for a while. The entrance to the gardens was actually free, except for a few specialty gardens like the Orangerie, but I don’t think we missed much at all. There were a few fountains and gorgeous flowers throughout to show off the elegance it maintains. 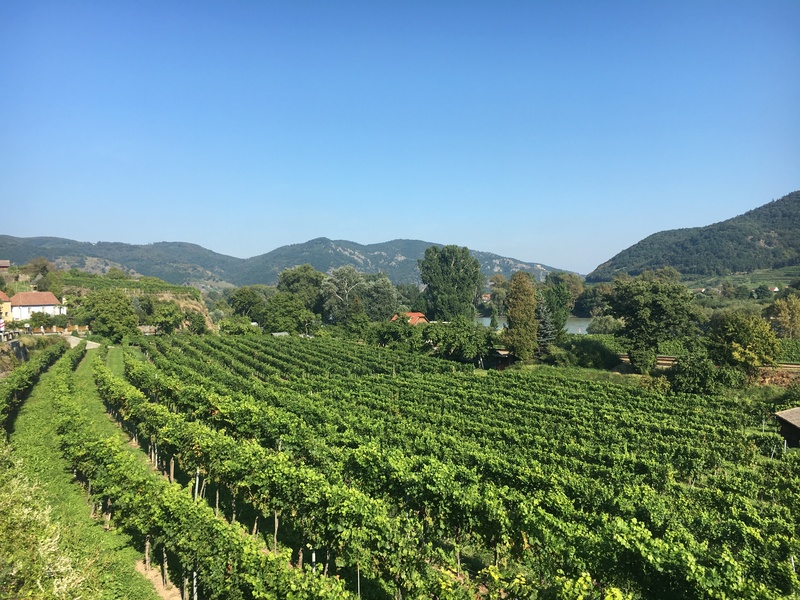 We could easily have spent a day wandering and picnicking, but as always we had something more to see. 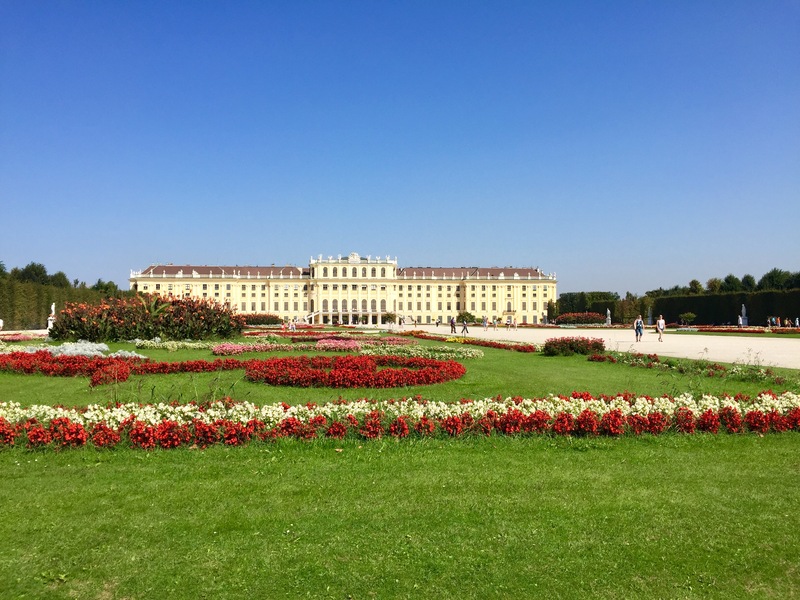 By late afternoon, we left Schonbrunn Palace and headed back to the city to check out Hofburg Palace located within city center – we snapped a few photos along the way. 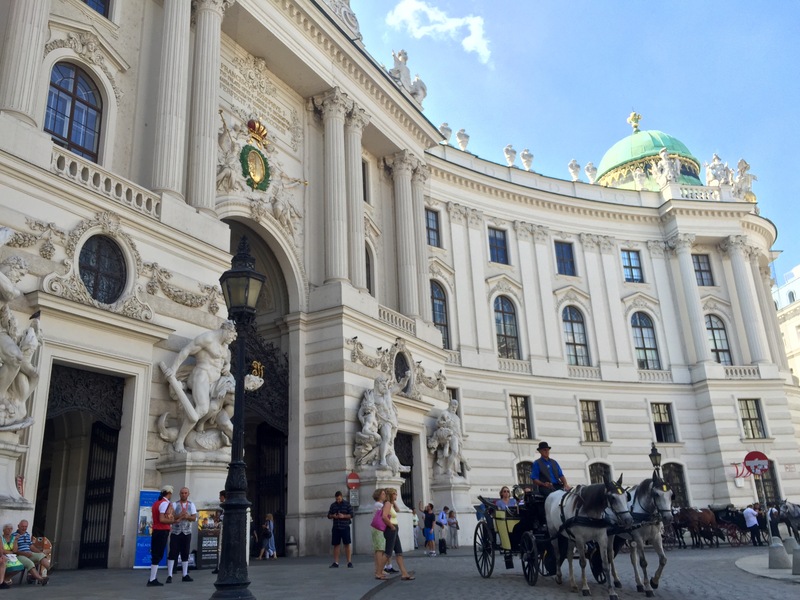 The Hofburg Palace consists of the Imperial Apartments and Sisi Museum, and our pre-purchased tickets included entrance to both. 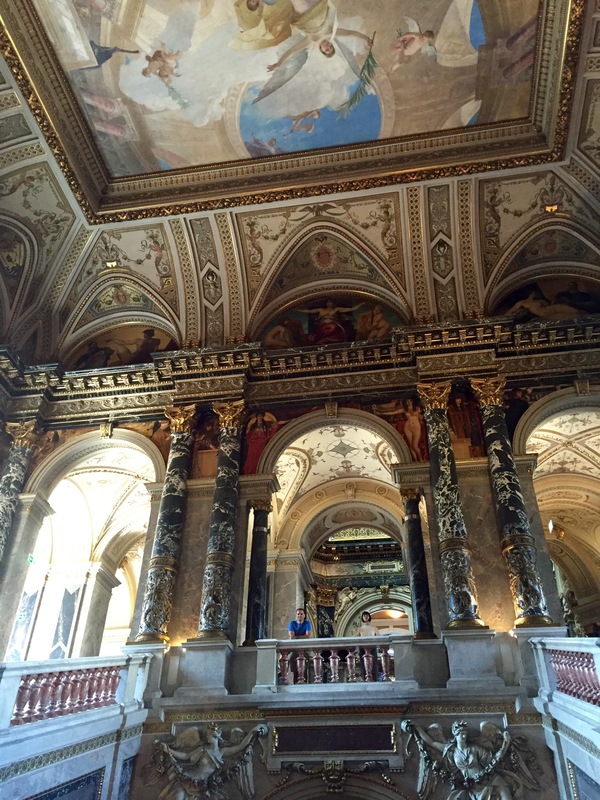 With another free audio guide, we made our way through the palace and museum. 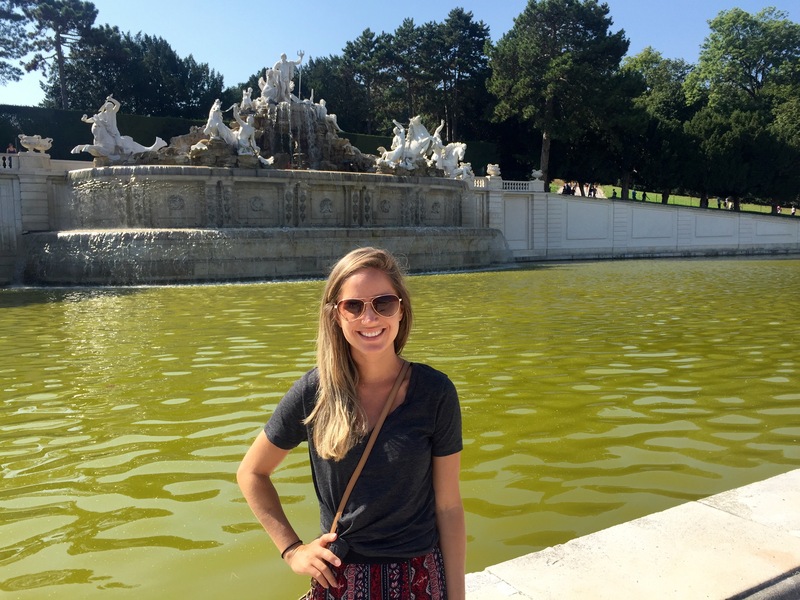 It was sort of a continuation of what we had seen in the Schonbrunn Palace so it fit with the theme of the day. It was interesting to see everything, but once we were in the imperial apartments it was way overcrowded. We did our best to see everything in the apartments with our audio guide, but every few minutes another huge tour group was crowding over us. Even so, it was still worth seeing, but expect large groups if visiting during peak time. 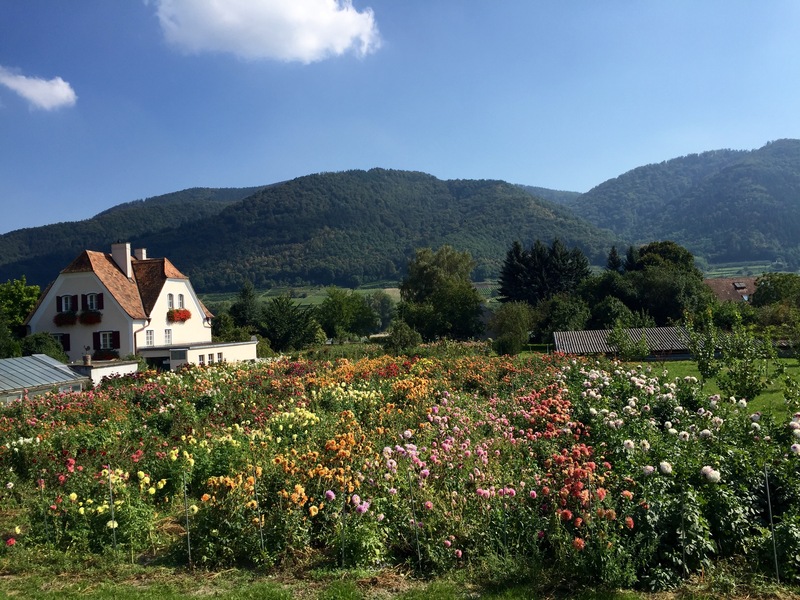 For our second full day in Austria, we escaped Vienna for a little break from city life. 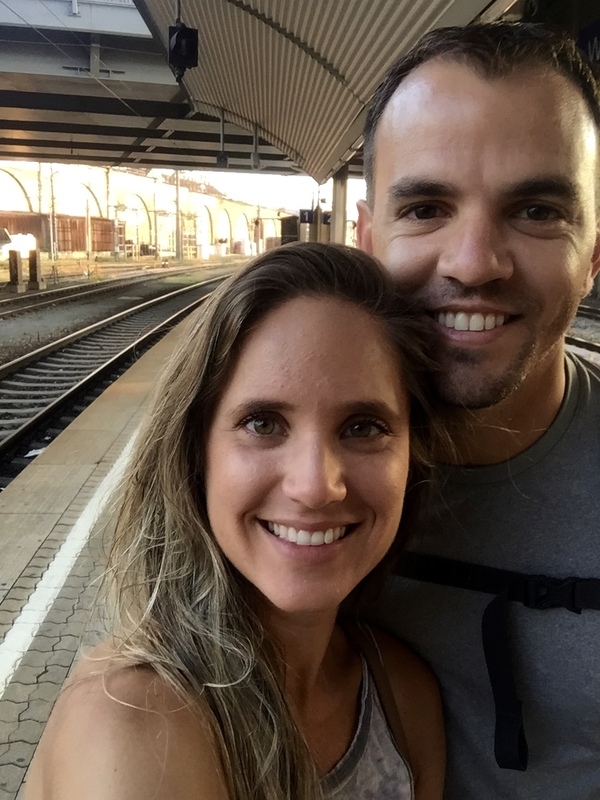 We’ve spent most of our time within busy cities since leaving the quaint destination of Bruges, Belgium, so this was a welcome break. 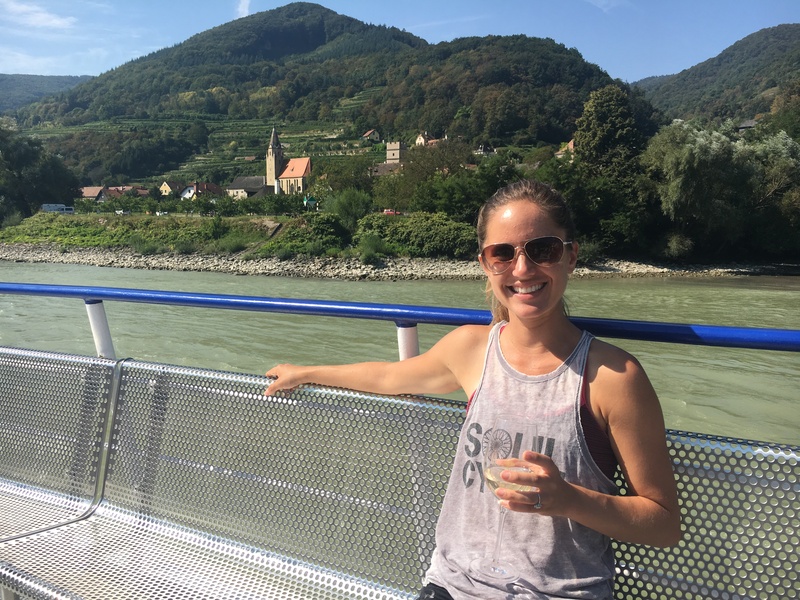 Whitney had been looking up biking trips and tasting tours through Austria’s wine country. As I don’t drink anymore, we decided to make our own self-guided tour. 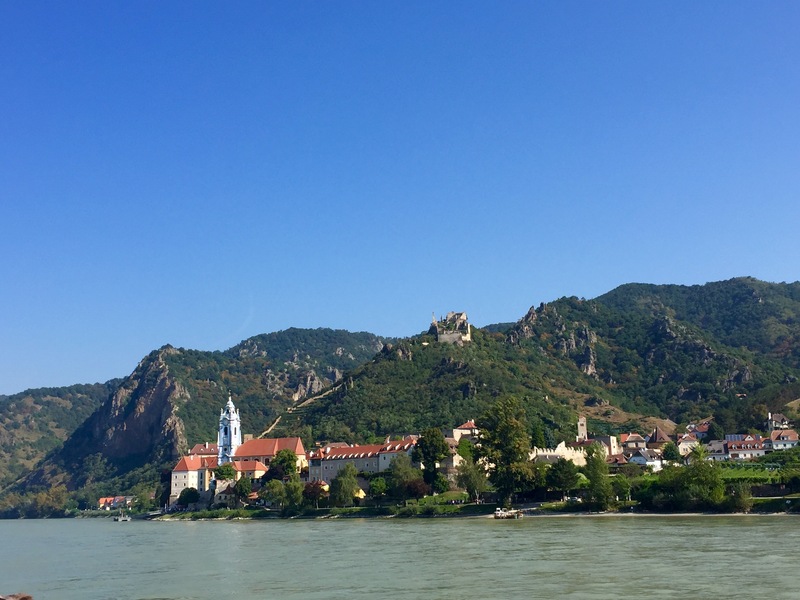 We put together a route that would take us through the famed Wachau Valley, from Melk to Krems (about 36km), riding downstream AKA downhill for the entire ride. 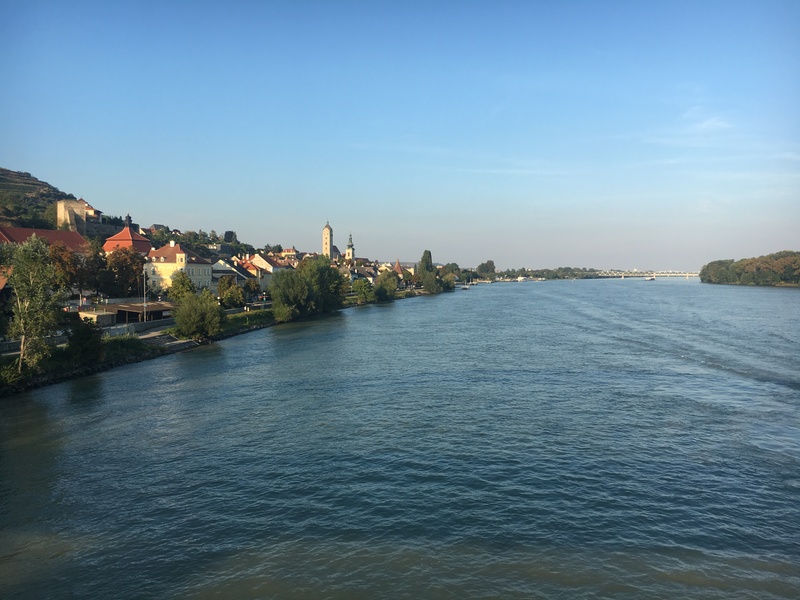 In order for all the pieces to come together, we needed to catch the 7am train from Vienna to Krems, walk to the bike shop on the far side of the river to pick up our rental bikes, and then ride back to the ferry dock to catch the 10am ferry to Melk boarding with our bikes. 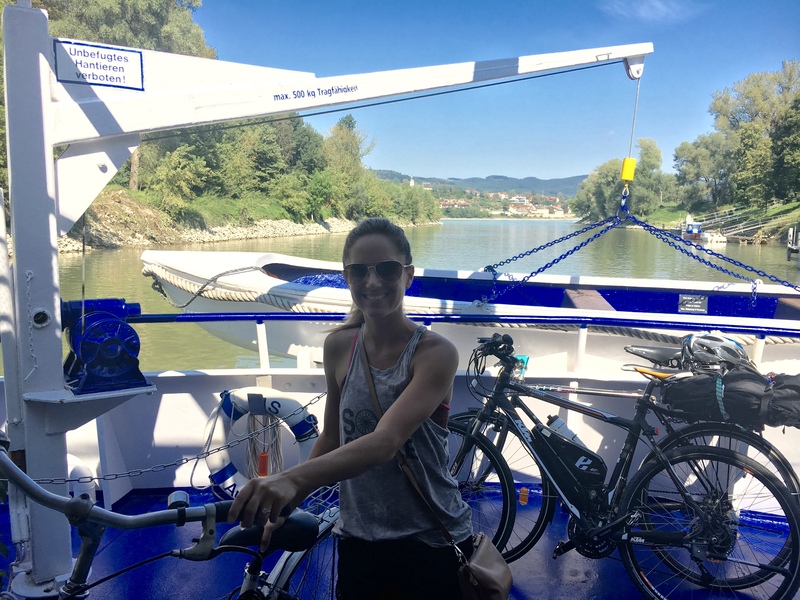 This would allow us to ride back from Melk to Krems (downstream), return the bikes and head back home from there. We had quite a task in front of us when our alarm went off early in the morning, but we managed to make it just as planned. Once we made it on the ferry with our bikes, we could finally relax. 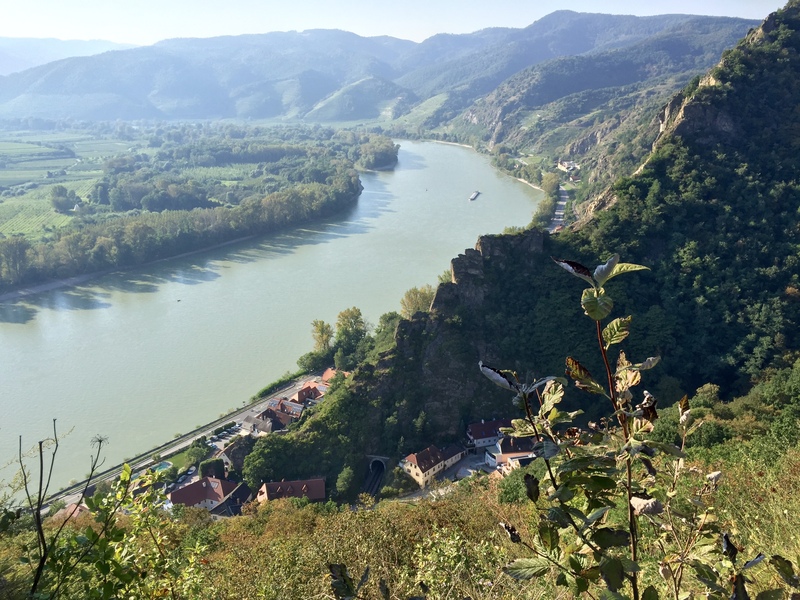 It was a beautiful 3hr cruise up the Danube River to the town of Melk. We sat on the upper deck, soaking in the sun and the views along the way. We even had a couple drinks and split our packed lunch in preparation for our long bike ride ahead. Soon enough we were disembarking from the ferry and ready to get started on our ride. 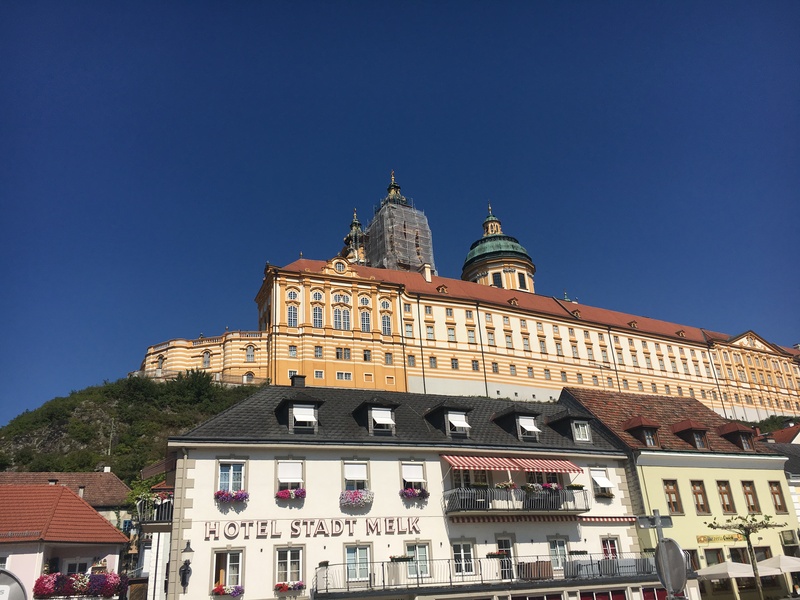 We initially tried to make our way up to see the Melk Abbey, but after taking a few wrong turns we just settled for a couple pictures from the distance, plus there were tons of buses taking ferry passengers straight there so were fine avoiding the clusters of people. 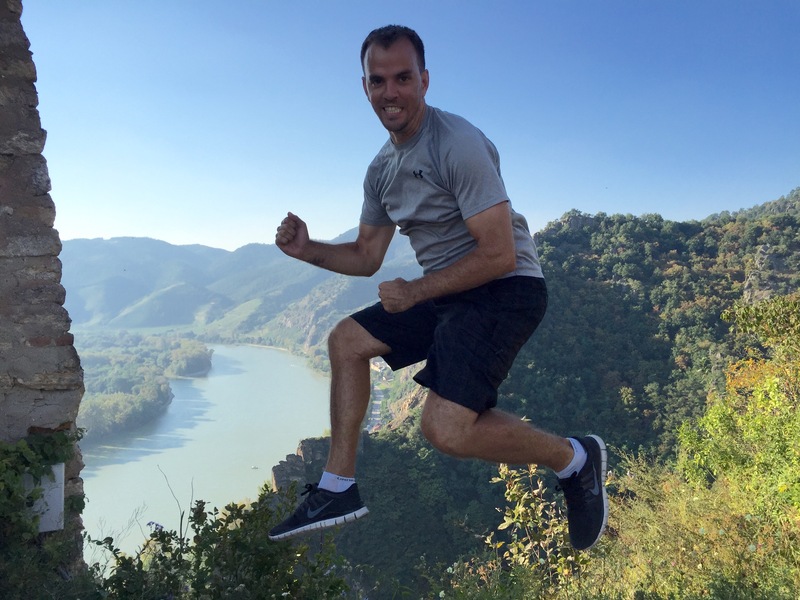 Instead, we headed off on the bike trail running along the edge of the river. 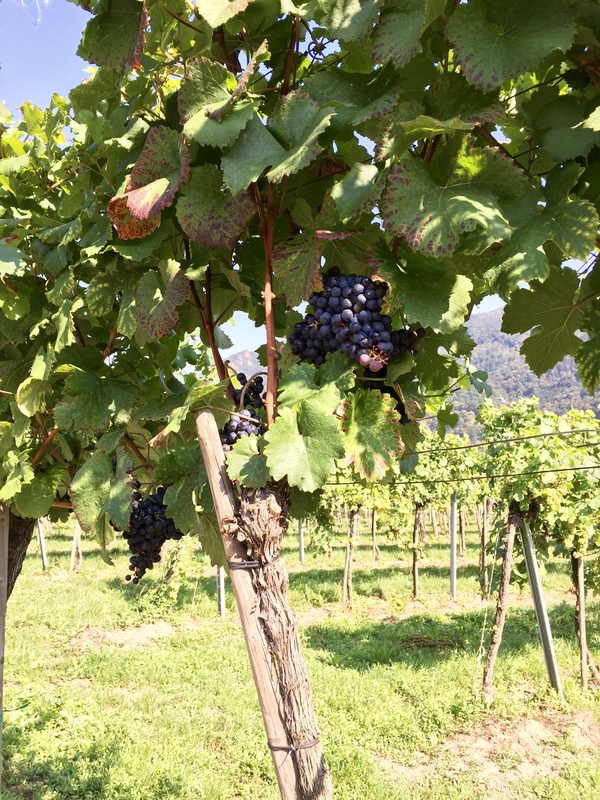 We passed numerous farms and vineyards breathing in the fresh air and enjoying the outdoors. 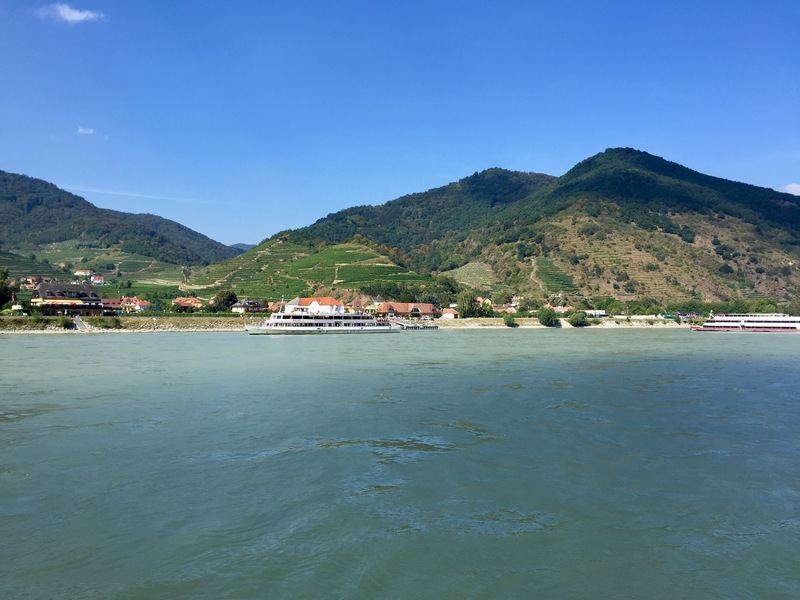 There are a couple crossings along the way via a small ferry that simply crosses the river, (there were no bridges in this area). We slowly took this relaxing ride stopping every so often for pictures. 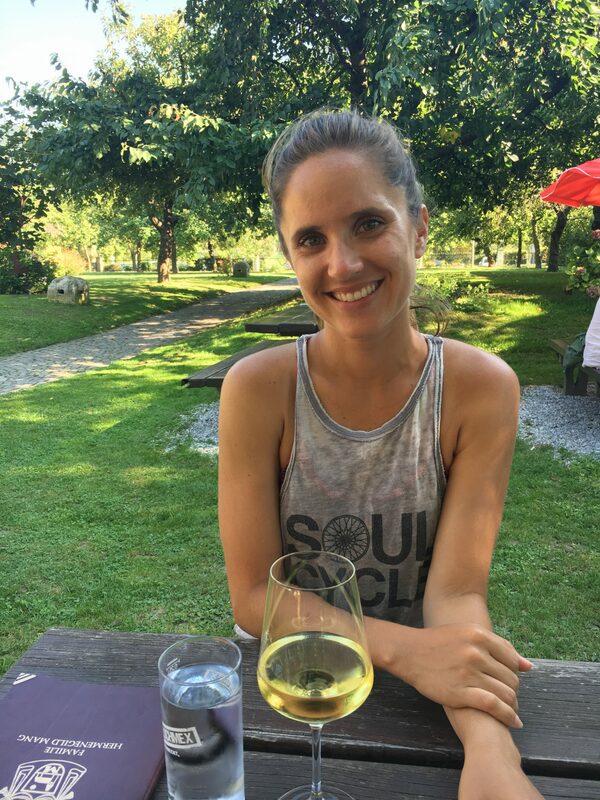 Whitney even selected a cute little vineyard in the small town of Weissenkirchen to savor a glass of the local wine and take a little break. 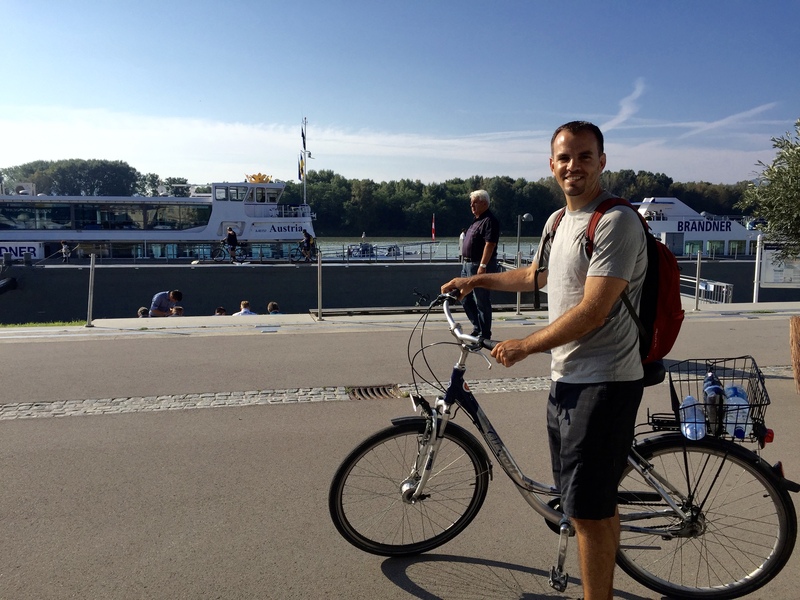 It was one of the most pleasurable bike rides we’ve had and would definitely do it again. Tip: don’t bike ride up stream, the people going in that direction looked miserable. 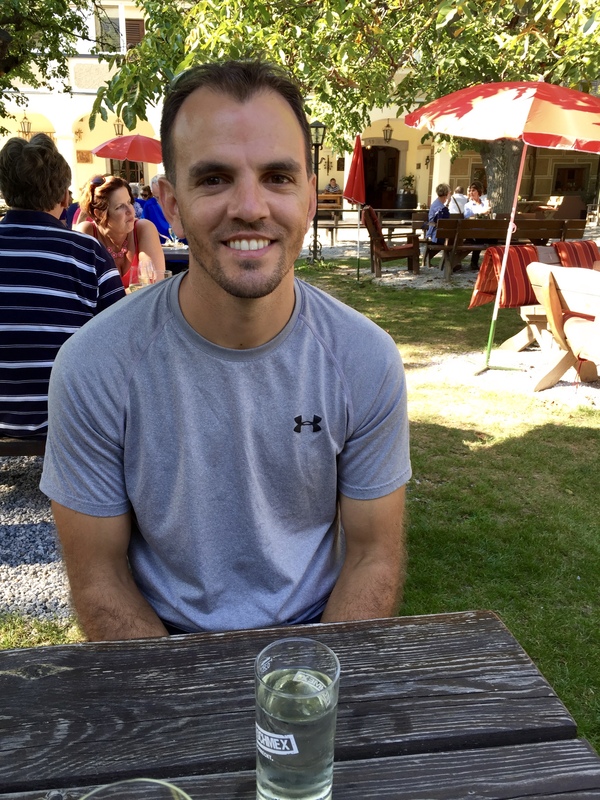 Our last stop on the ride was in the town of Durnstein. This small town appears to cater to the tourists passing through with a variety of souvenir shops along the main pathway. However, it had something special. 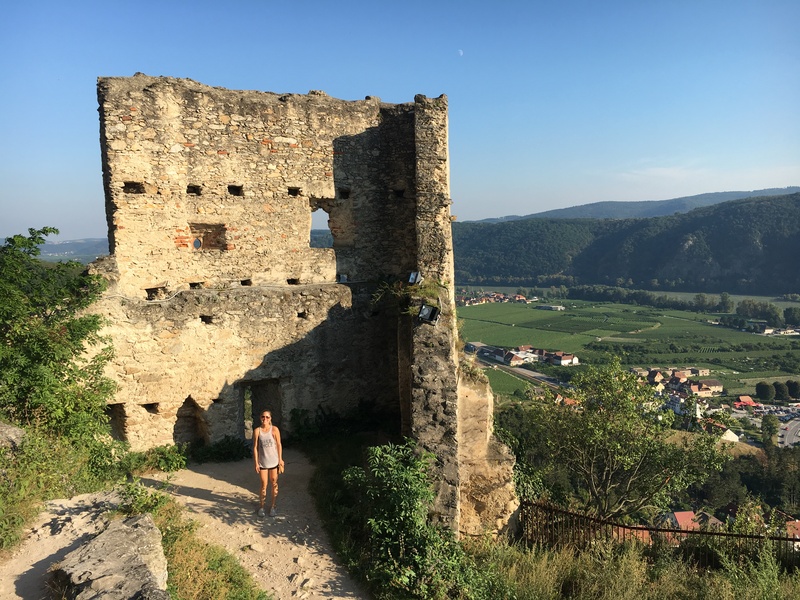 A winding trail leads out of the town, up the mountain to the ruins of Durnstein Castle high above. We locked up our bikes and hiked up the steep trail. The views from the top made the hike well worth it. Just look at these views knowing that the pictures never do it justice. We eventually made it home and cleaned up before heading out to find dinner. It just so happens that the dinner prices eventually led us to another Asian restaurant. The food was amazing and much needed after the long day. 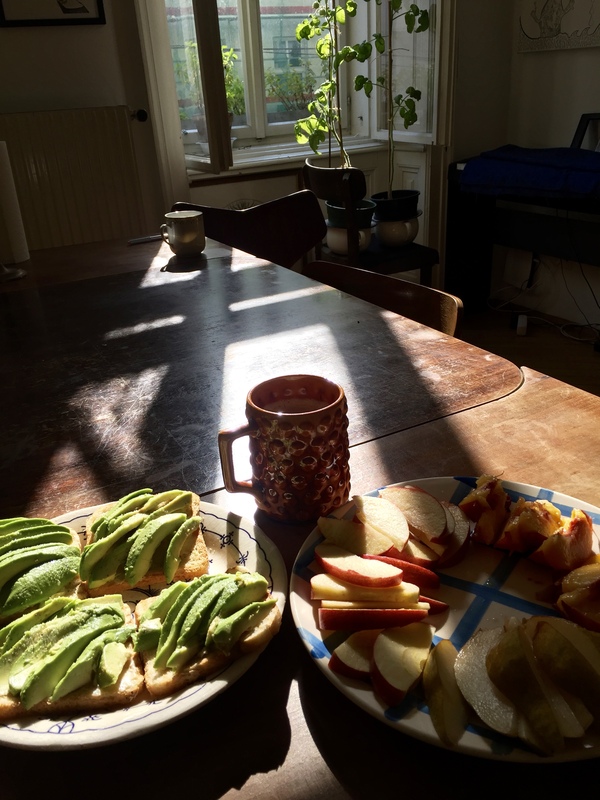 For our final day in Vienna, we slept in and made breakfast, but planned to spend all day in the city center. 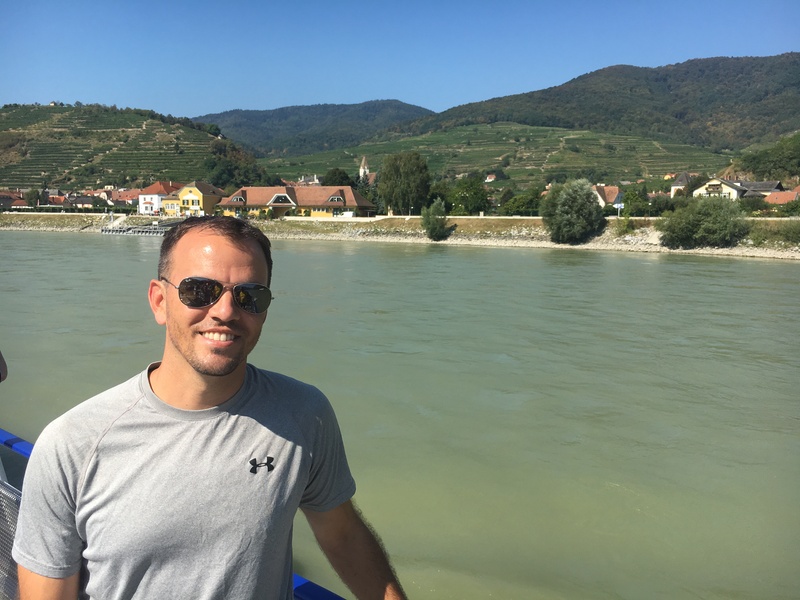 We had only a few specific things we wanted to see that included St. Stephan’s Cathedral, Kunsthistorisches Museum, Museum Quartier, and Volksgarten, while taking time to wander the main city streets. 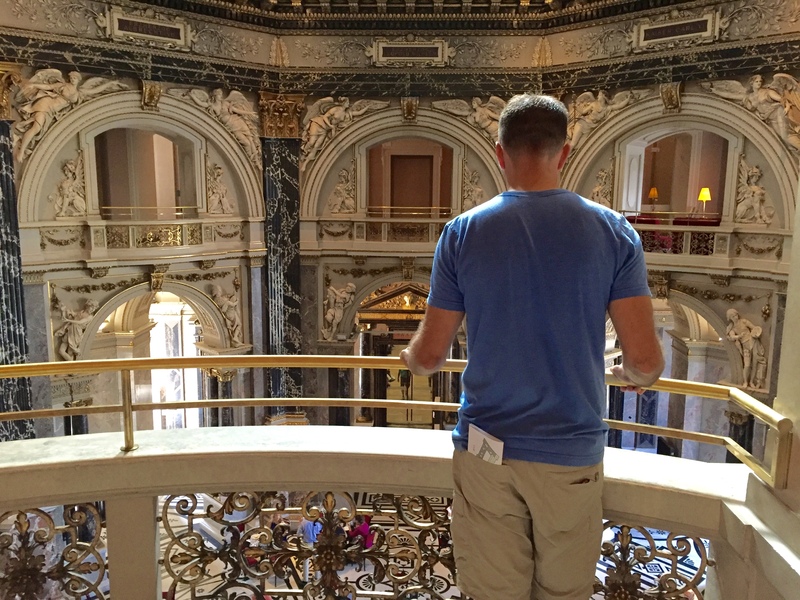 We set off late in the morning to see it all with our first stop being the Kunsthistorisches Museum. 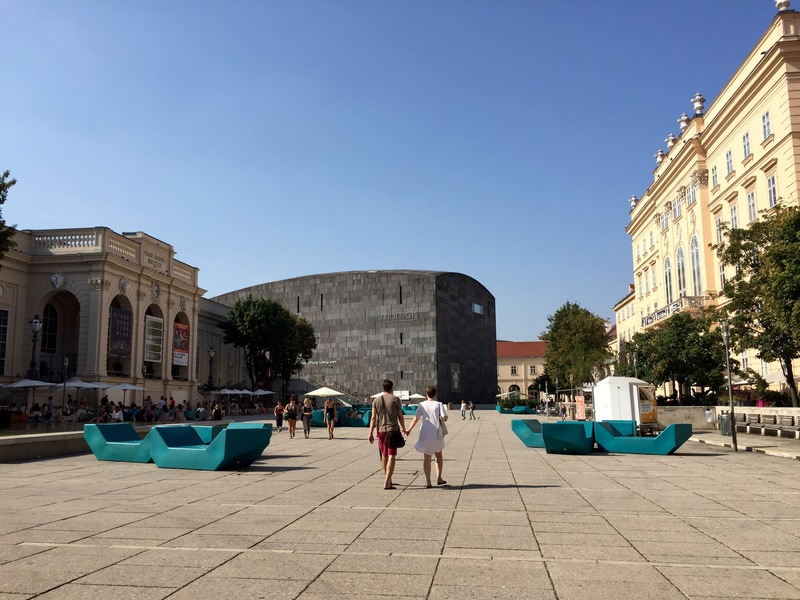 This Museum of Art History was first opened in 1891 by Emperor Franz Joseph I. 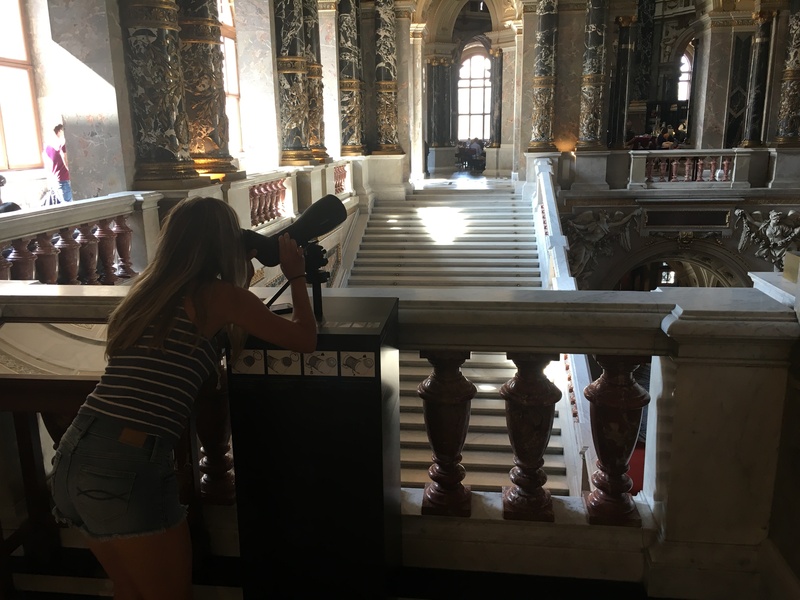 He commissioned this museum as well as the Naturhistorisches Museum in order to have a suitable shelter for the Habsburgs’ formidable art collection and to make it all accessible to the general public. This was another example of how Franz Joseph chose to live life less extravagantly than your typical royal family, putting all the family’s valuables into a museum rather than hoarding it to himself. 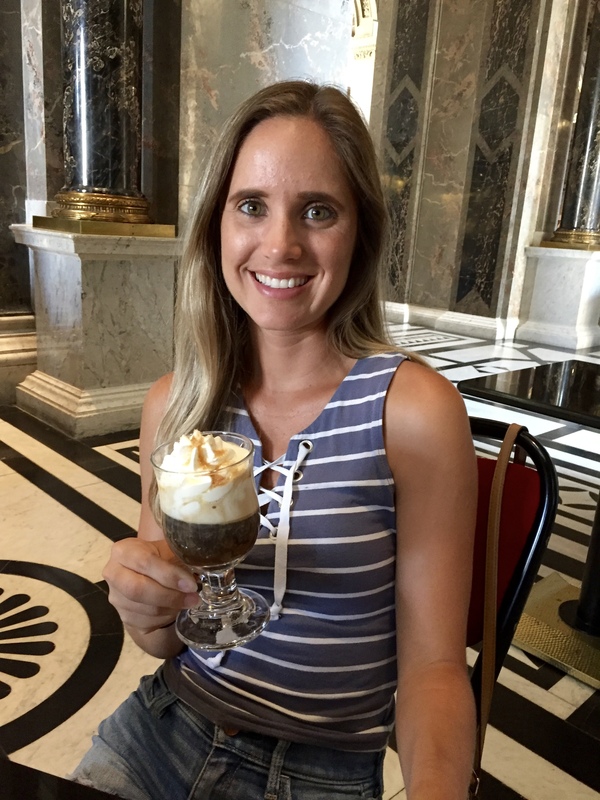 We checked out a few things then found the small café beneath the huge dome of the building hoping to split some coffee and cake. (This is now one of Whitney’s favorite things to do). We slid into a table just as a few people were getting up and placed our order. Somehow we felt high class sitting there sipping away. Continuing on through the museum we saw so many beautiful works and I’ll say this was probably one of my favorite museums of all time. 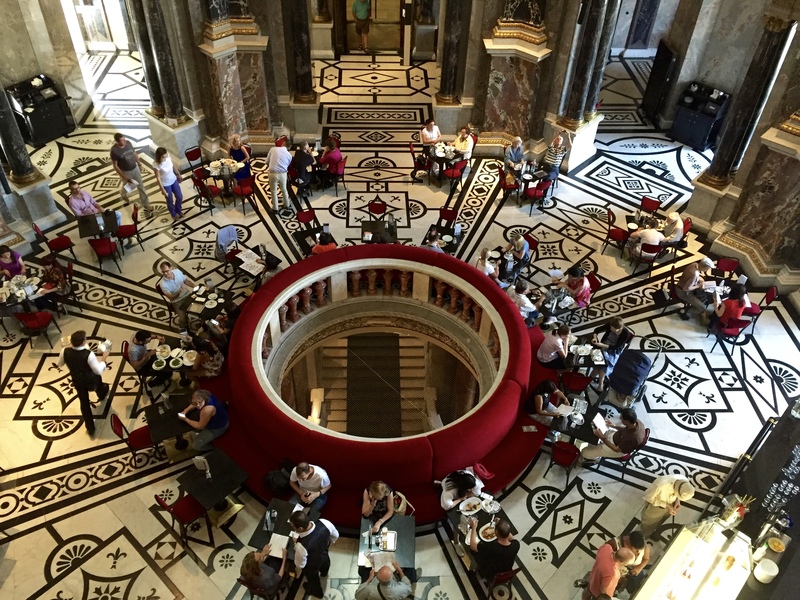 It was the heat of the day when we left Kunsthistorisches Museum, but we carried on as planned to check out the Museum Quartier. This area is known to be filled with local students spread out in the evening similar to New York’s Union Square (sorry, most of my references are from NYC, but hopefully everyone can still relate). There wasn’t much happening there at that time of day though. 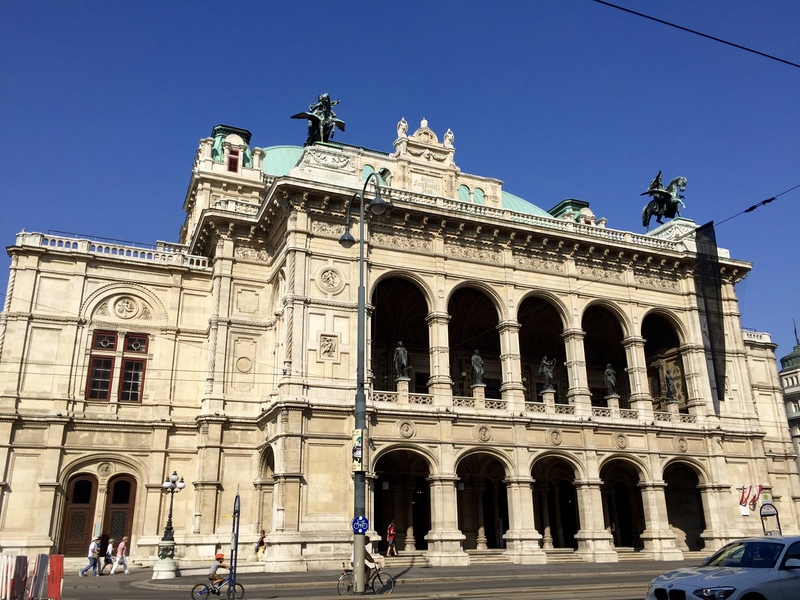 Still, we snapped a few pictures, then wandered further past Vienna’s Opera house. The lobby was locked, so we only passed by. 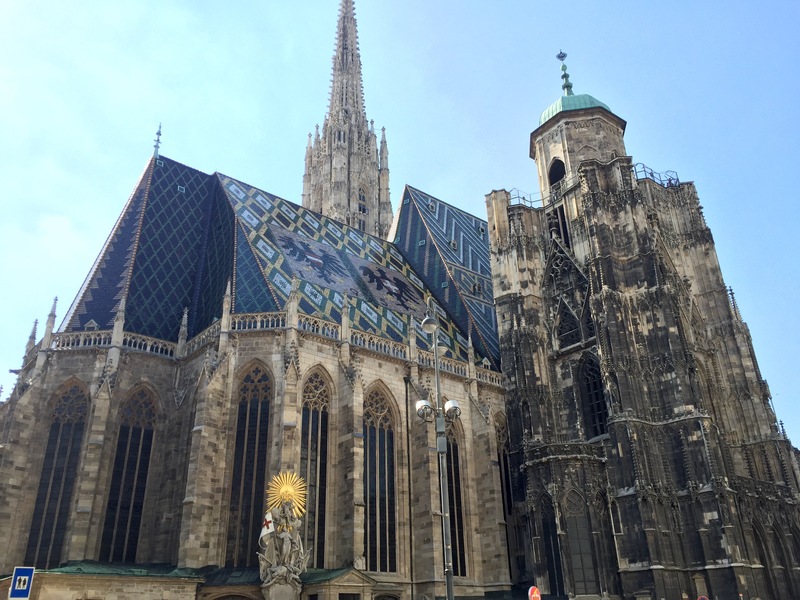 Next we arrived back to St. Stephan’s Cathedral where we had first arrived from the subway. We paid the usual fee and climbed to the top of the bell tower (we can’t forget this hobby of ours). 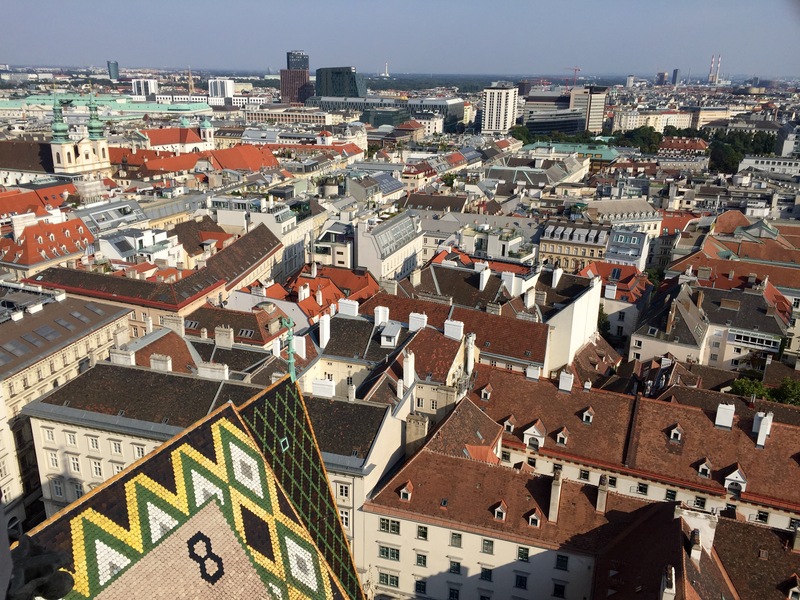 One of the highlights at the top was simply looking down at the gorgeous colorful roof top. The roof was made in some local ceramic factory with a secret formula for the colors; it’s been a secret since its creation according to something I read. Afterwards, we took a peek at the inside of the cathedral. It was nice to see, but after seeing so many cathedrals over the last couple months, they are beginning to run together. 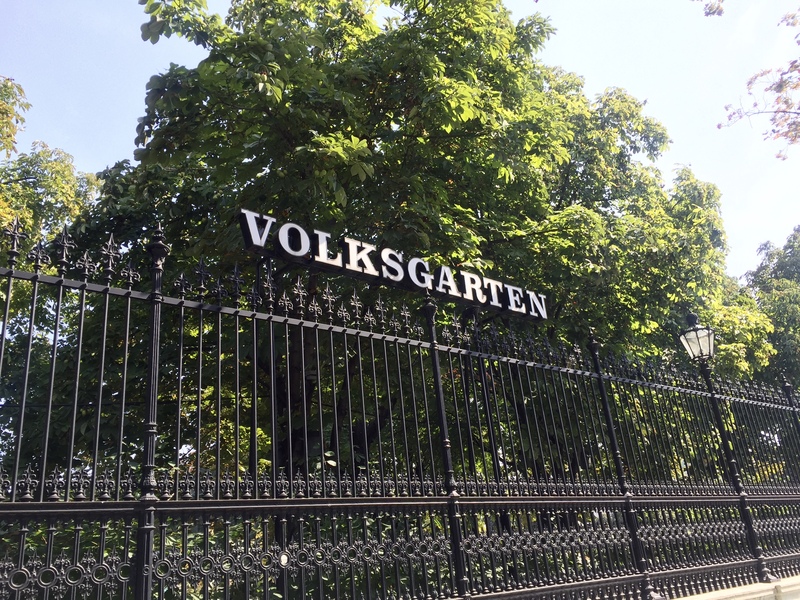 To finish up our time here we entered Volksgarten. 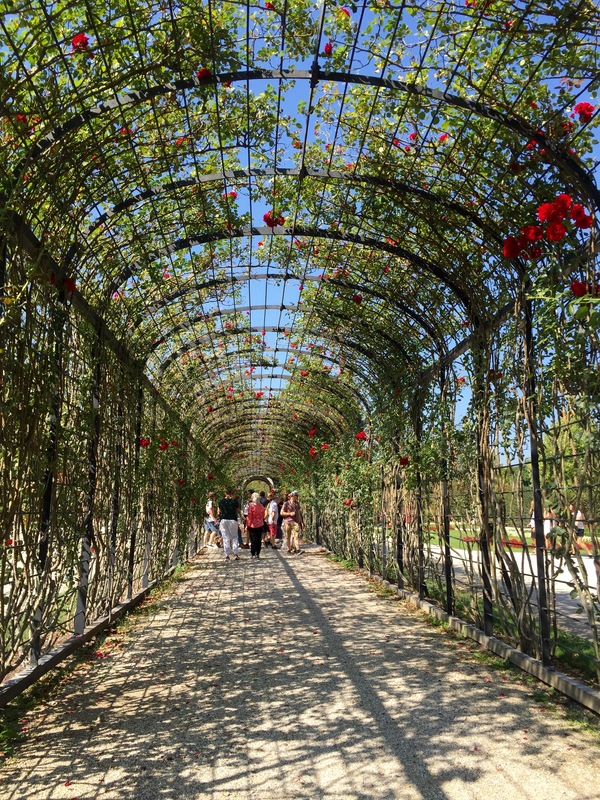 This manicured garden sits behind the Hofburg Palace and is definitely worth checking out. We relaxed a while on the chairs looking over some flower gardens, then decided we would make the long walk back to our Airbnb (we are always hiking, even if it’s just along the city streets for miles). 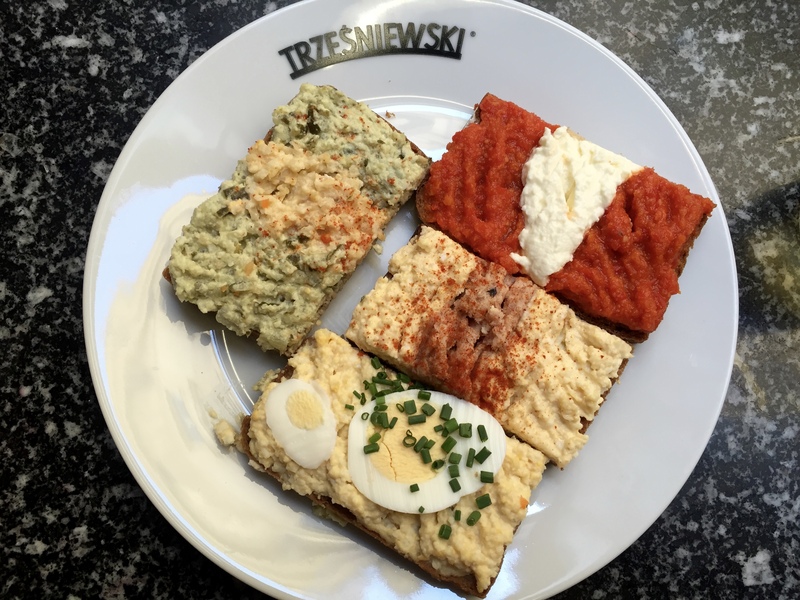 A little snack near the park..so delicious! 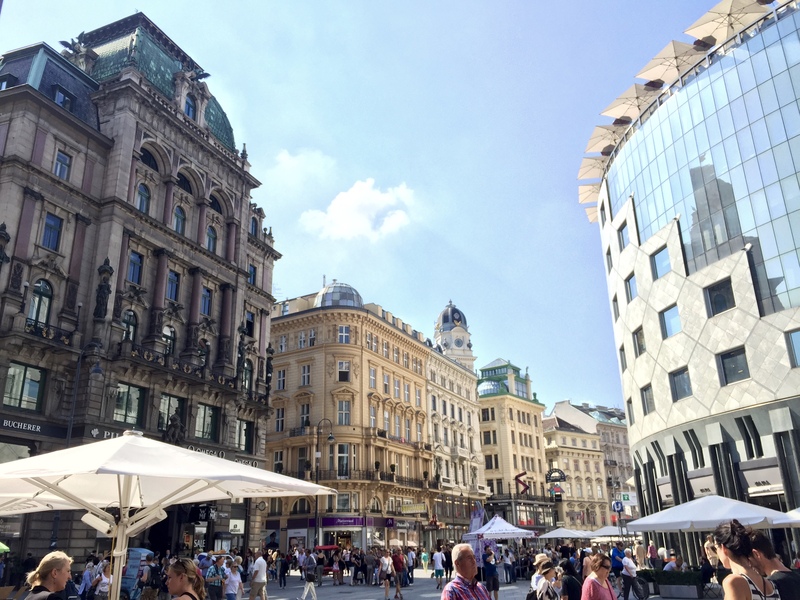 In the end, we did enjoy our time in Vienna, but in comparison to Prague we didn’t like it quite as much. 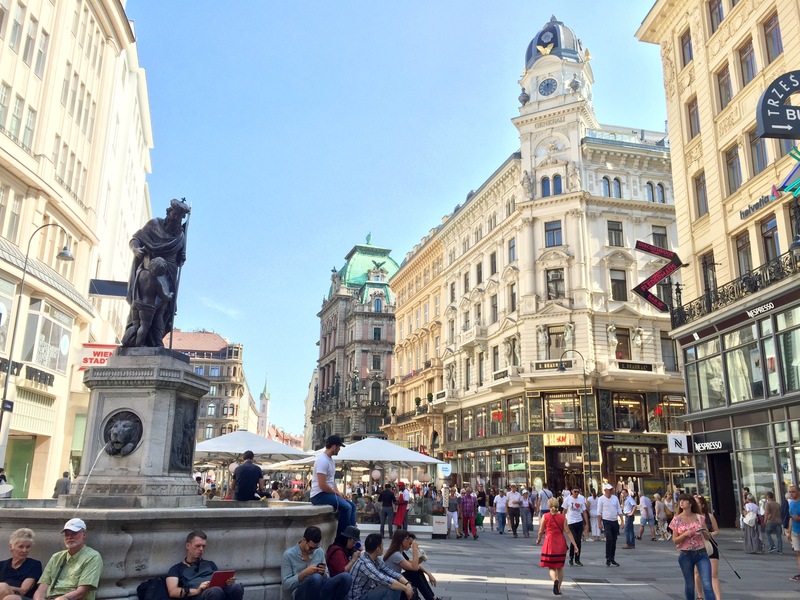 Vienna seems much bigger than Prague losing some of the charming details of the smaller city. The museums do give it an upper hand as we have not really been too excited about going to museums on this trip beyond the Louvre in Paris and some of the history museums in Berlin. 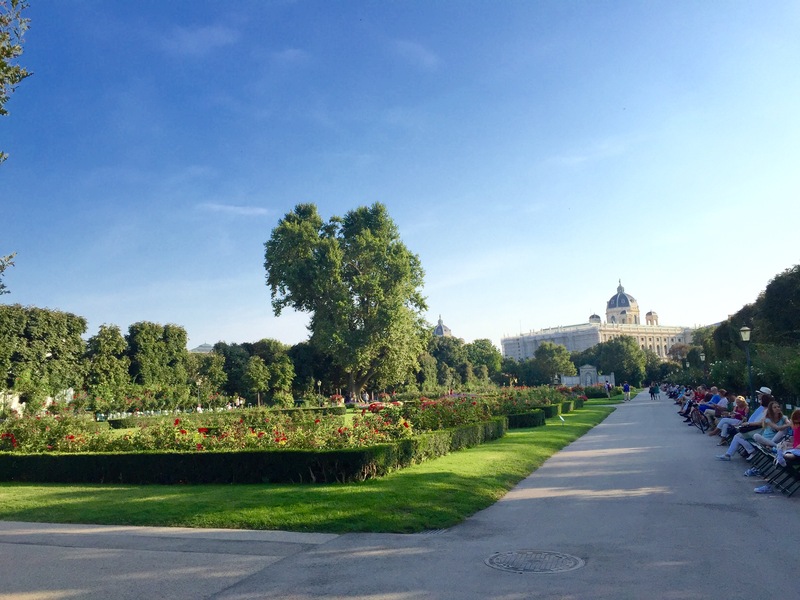 Vienna was not really as walkable as we had anticipated, but we still saw most of it on foot. 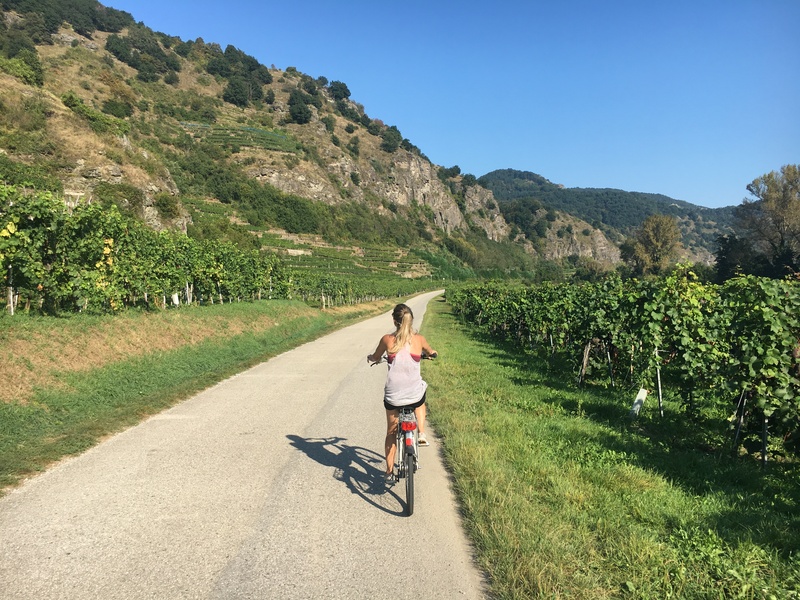 We absolutely recommend taking a bike tour through the countryside and vineyards, but it would probably be a lot easier and not much more expensive to join one of the prearranged tours. 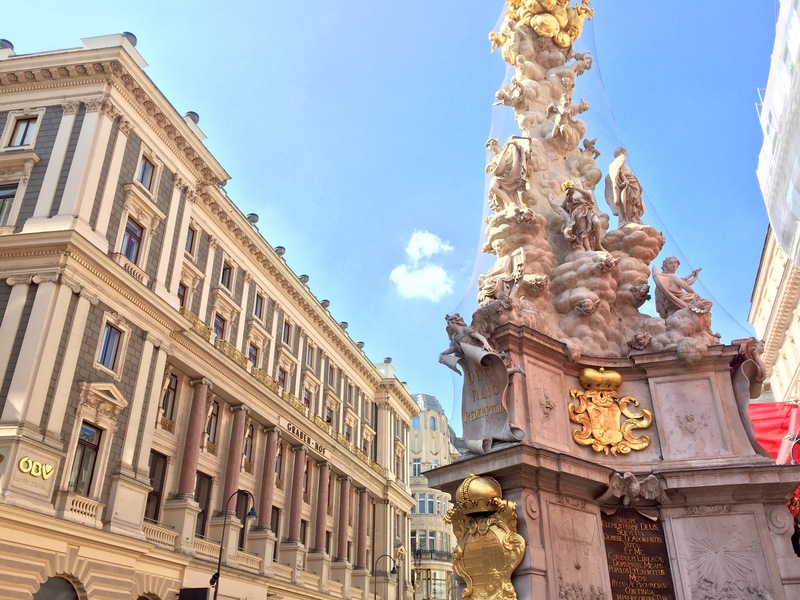 Finally, Vienna is a beautiful city with a lot of history to see and understand. 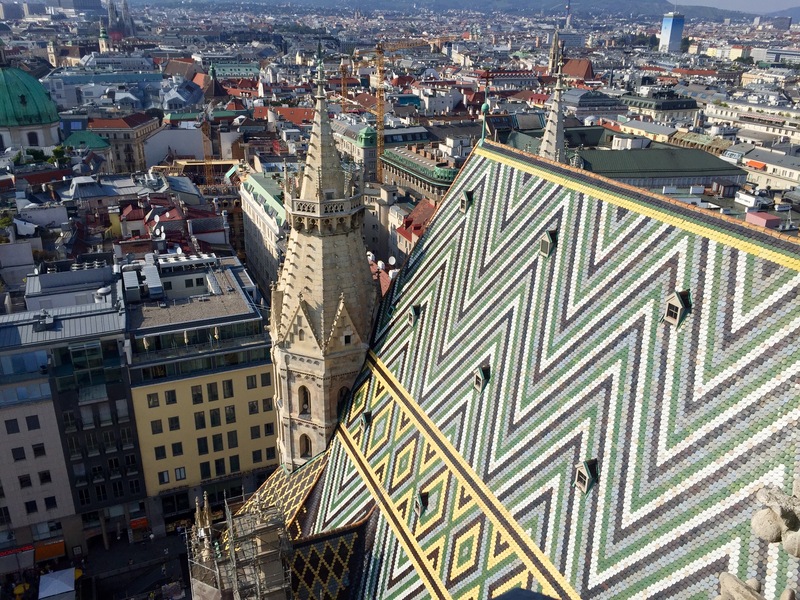 I’d encourage the next traveler to see Vienna before going to Prague to avoid being spoiled in the transition. 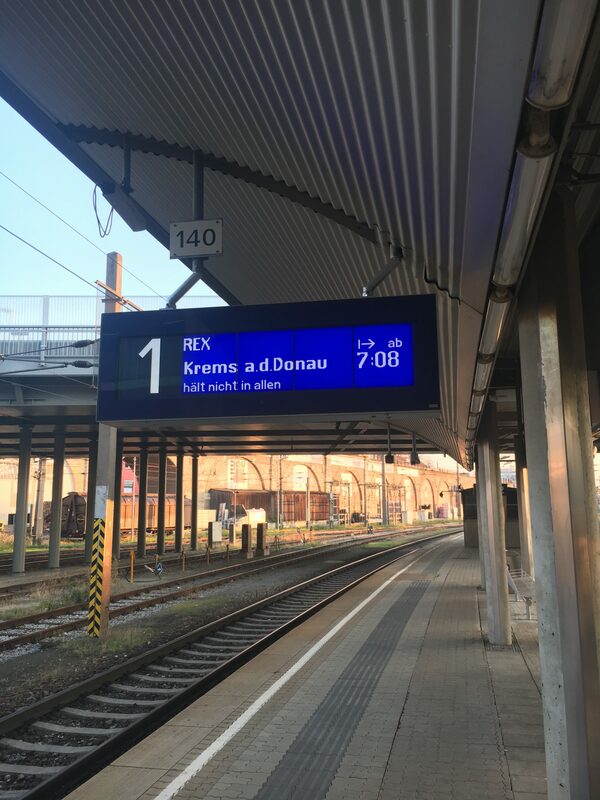 That’s all for now, time to catch the train to Budapest!